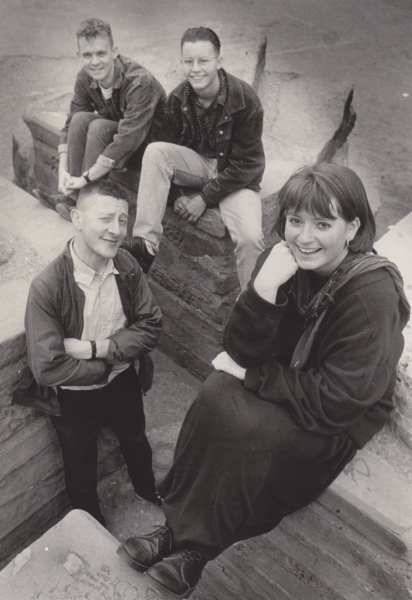 Formed in June 1988 in Hull by Nick Langley (bass & vocals) and Alison Hughes (rhythm guitar & vocals), they travelled the length and breadth of the country pedalling their twee indiepop, having picked up Hugh Whitaker (drums & vocals) and Steve Parry (guitar) along the way. They released 3 tapes: "Sunny Enough For Cats", "Sunny Enough For Cats Too" and "Wossname" as well as "Taj Mahal", a 12" EP. Nick left the band in August 1990 after a triumphant gig at the Reading Festival - Hugh and Steve had already moved on by this point - and the band finally disbanded in March 1991. I, for one, thoroughly enjoyed myself!